Having an understanding of what normal sleep looks like helps us identify when we are experiencing worrying sleep difficulties. Anecdotally, many people believe that good healthy sleep involves one solid period of sleep from lights out to waking in the morning. 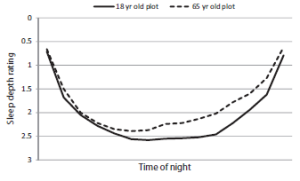 Recently, a group of Australian researchers tested this hypothesis by asking a group of young (18-25 years) and older (60 years and older) to draw what they thought normal sleep looks like on a ‘Sleep Plot’ for an 18 year old’s and a 65 year old’s sleep. 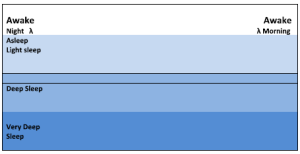 An example of the plot is displayed below. Individuals in each group were asked to draw one continuous line across the normal night time sleep period that indicated the transition between different sleep stages across the night. What would you draw? 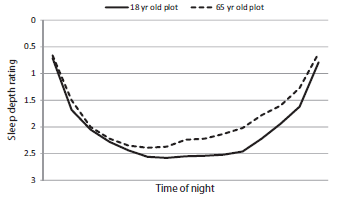 A substantial majority of people (69%) drew a single U-shaped curve that indicated that people enter sleep through light sleep, transition into deep sleep, then move back through light sleep until waking. The average curves drawn by both age groups are plotted in the figure below. With the exception of lighter sleep for older adults, most individuals thought that the characteristics of sleep were similar for 18 and 65 year olds. Only 5% of young adults thought that normal sleep, regardless of age, included a period of wakefulness during the night, compared with approximately 23% of older adults. While this may not seem groundbreaking, it does tell us some important things about people’s beliefs about sleep, particularly that individuals don’t expect to wake overnight. Consolidated sleep at night is most likely a result of the demands of modern lifestyles as well as modern use of lighting. In historical times, it is likely that we slept in two bouts across the night with a couple of hours spent awake in the middle of the night. Notably, in these times, bed and rise times were more closely aligned with sunset and sunrise. In general, sleep stages cycle across the night (from light sleep to deep sleep to REM sleep), with briefs periods of awakening interspersed throughout the sleep period. Most of these awakenings are not remembered in the morning but it is not uncommon for us to remember one or two brief awakenings. A few brief awakenings do not cause significant disruption to sleep. It is also important to note that as we age, sleep becomes more fragmented with less deep sleep and more awakenings during the night. Bruck and her colleagues have hypothesised that unrealistic expectations about normal sleep could lead someone to become concerned or distressed about their sleep. This might be especially true in older adults, who might not expect to wake overnight but experience frequent or prolonged awakenings. It was suggested that more community education about sleep may lead to less anxiety about sleep fragmentation and help prevent the development of insomnia in older adults. Reference: Bruck, D., Dolan, C. L., & Lack, L. C. (2015). Beliefs about the ‘shape’ and continuity of healthy sleep as a function of age. Journal of Psychosomatic Research, 78(1), 39-44.